Alfred Hitchcock’s I Confess (1953) is best known (though it is not well known enough) for its dramatically and theologically compelling representation of the sacrament of reconciliation. 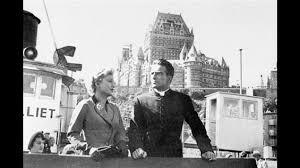 In the film, set in contemporary Quebec City, a German refugee named Otto Keller commits a murder, and then confesses his crime to his priest, Father Michael Logan (Keller and his wife work in the rectory). The priest can then say nothing about it to the police, even when suspicion falls upon him. The Seal of Confession prevents him from letting on in any way that he knows anything about the perpetrator or circumstances of the murder. The personal and pastoral drama of all this is heightened by the fact that it had been Father Logan who had arranged for the Kellers to come to Quebec at the end of the Second World War. The heroic resolution of Father Michael Logan (as played by Montgomery Clift) renders him positively Christ-like; and a new look at this old film’s treatment of sacramental confession would have been particularly appropriate in the recently-concluded Year of Mercy. I would like to focus, however, on what the film says about ordination and marriage. I believe it might usefully illuminate one of the implications of Amoris Laetitia – the “careful discernment and respectful accompaniment” of persons whose marriages have run into irregularities. The couple featured in the film, the Grandforts, have not divorced; but their marriage is not in very good shape. Pope Francis’ much-anticipated Apostolic Exhortation has neither indulged the hopes of liberal nor confirmed the fears of conservative Catholics. Those who have entered into sacramental marriages, and whose married lives have encountered complications, are supposed to meet with their pastors, and with their help sort out what is to be done. It may be that the marriage should be annulled (because there never was a valid marriage); but the discernment might also reaffirm the marriage; and the accompaniment of the pastor is certain to involve his example as a person who is faithful to his sacramental way of life. We can see this too in the ministry of Father Michael Logan. I Confess represents not just Father Logan’s exercise of his priestly ministry, but the discernment and development of his priestly vocation, as depicted in the parallel plot involving his old friend Ruth Grandfort and the attempt by a M. Vilette (the murder victim) to blackmail her over her old friendship. Ruth, convinced that Father Logan will be arrested if she does not provide him an alibi, tells all not only to a police detective and the crown prosecutor, but to her husband, who is also present. Her attempt to exculpate Logan involves an account of her marriage, which is represented as validly sacramental but desperately unhappy. Ruth’s dramatic and detailed statement is, in a sense, the most illuminating confession in the film, though she sheds only partial light on her reasons for marrying, and on Father Logan’s reasons for becoming a priest. Of course, there will always be some mystery about these things. Ruth goes on to recount how she came to meet and to marry Pierre Grandfort, who she says was kind to her in her unhappiness. “We got married,” she says; “I was happy.” She will later declare that she does not love her husband, but according to Catholic theology, she is nevertheless married. The Catechism of the era makes clear that sacramental marriage is based not on love but on “The consent of the man and woman,” and that “the consent is the efficient cause of the marriage.”  A man and woman who consent to be married form a tie and take on an obligation that is considered indissoluble. Though both Scripture and the Church Fathers speak of the love that a husband and wife should have for each other, it is not necessary for that love to precede the marriage or to impel them to it. This is a particularly difficult and perhaps even distasteful notion; but when it comes to marriage, Catholic theology resists both modern sentiments and cinematic conventions. There are plenty of films in which a woman who does not love her husband leaves him for the man she does love (there are even a few in which the man is a priest). Matrimony and Orders are easily represented as repressive conventions, and filmgoers may well have expected – or may now expect — to see them thrown off here. That they are not is a surprise, but a theologically coherent one. As it is the duty of the pastor to seek the holiness and perfection of the faithful, his earnest desires must be in full accordance with those expressed by the Apostle when writing to the Corinthians: I would that all men were even as myself, that is, all men should embrace the virtue of continence. Though clerical and marital chastity (which for the priest means continence, and for the married couple means fidelity to each other) are described as “gifts,” the Catechism maintains a resolute distinction between “the contemplation of heavenly things” and “the unruly desires of the flesh” (338). Marriage is an acceptable concession to sexuality, but it is better to be celibate. And indeed, Father Logan is represented as a better person than Ruth. His seriousness is contrasted with her selfishness. She marries Pierre not long after Michael had stopped writing to her. Five years pass between his deciding to become a priest and his ordination – five years that would have been devoted to theological study and pastoral service. The film shows both the marriage and the ordination, but in ways that reflect the disparity between the conjugal and the clerical. Ruth and Pierre are shown in a receiving line following their wedding ceremony: a social and secular moment that elides the sacramental. Conversely, Michael is shown kneeling before the Bishop who lays his hands upon Michael’s head – the very gesture that confers priestly powers. Ruth is unfaithful to her husband, because of her old selfish love of Michael; Michael is faithful to his vows, even when to be faithful is dangerous. The scene in which Ruth and Michael meet on a ferry boat makes clear that he is a better priest than she is a wife. That meeting takes place shortly after Ruth learns, unofficially, that Fr. Logan is a suspect in the murder of Villette. She and her husband are friends of the prosecutor, who had mentioned to them this awkward twist in the case. It seems a priest was seen leaving Villette’s house on the night of the murder (Keller had worn a cassock). Ruth wants to warn Fr. Logan, though he already knows he is a suspect. Their conversation then turns to the impropriety of their meeting. She had told him of Villette’s attempt to blackmail her, and he had undertaken to speak with him; but the murder took place on the evening before they were appointed to meet. Both he and Ruth arrive at Villette’s house the next morning to find a crowd gathered at the crime scene. They had not arrived together, but are then seen together. They had actually been together at the time of the murder, discussing the blackmail (though not plotting the murder). We do not know it yet, but what Villette knows about the relationship between Mrs. Grandfort and Fr. Logan would, if generally known, be awkward for both of them but especially for her. Fr. Logan tells Ruth that in dealing with this situation she must think of herself and her husband. Ruth replies, “Think of Pierre? Think of him before I think of you? I have never been able to do that.” She says that Pierre still loves her but that she does not love him. “I’m not that good,” is the way she puts it. She tells Fr. Logan that she is still in love with him, and she wants to think that he is still in love with her. Professions of love in worldly movies are often presented as revelations of a truth more powerful than such outward circumstances as marriage or priesthood. Ruth thinks she is telling the truth; she admits that to be in love with a priest is wrong, but assumes that to say anything else would be a lie. In his response to Ruth Fr. Logan presents another view of what is honest, right, and true about them. In telling him she loves him she is lying to herself. He does not say that he loves her, though he does; he does not say that she is wrong to love him, though she is; the truth is that she is a married woman and he an ordained priest — he insists that she “see things as they are” and not as anything that might be gotten around. “The word matrimony,” the Catechism explains, “is derived from the fact that the principal object which a female should propose to herself in marriage is to become a mother.”  That Ruth has no children after seven years of marriage suggests that she may not be doing her conjugal duty. In enumerating the duties of a wife, the Catechism states that “the wife should love to remain at home, unless compelled by necessity to go out; and she should never presume to leave home without her husband’s consent.” Ruth frequently leaves home, and often without her husband’s knowledge. In several scenes, she drives a car. And it is by leaving home that she runs into trouble. As she recounts in her “confession,” she went to meet the ship on which Michael returned from the war. “He had changed, I suppose,” she says; “but I didn’t notice.” In the flashback that shows us these scenes, he is happy to see her, but looks uncomfortable when she embraces him. “We arranged to meet the next day,” she goes on as the scene dissolves to show them sitting together in a scenic field. He is speaking and gesturing; she is leaning against him and gazing at him adoringly. “Michael talked…talked,” Ruth tells us; “He told me all the thoughts that had come to him during the war.” This doesn’t sound like a recounting of his combat experience; what he is talking about more likely has to do with the discernment of his vocation. But “I didn’t want to hear about the war,” Ruth says, as she pulls him toward her and kisses him. Now even she becomes aware of his discomfort with this intimacy. As she removes her arm from around his neck, she is very obviously not wearing a wedding ring. She must have removed it. At this point a rainstorm erupts, and Michael and Ruth have to try to find shelter. A nearby cottage is locked, but behind it is a summerhouse. The rain that had dampened her ardor seems to have caused his to well up. When they have taken shelter in the summerhouse, he moves toward her, and now she obviously responds. The storm is perhaps meant to represent those forces of nature that Catholic marriage attempts to keep under control. Ruth is of course married to someone else, though Michael doesn’t know it. Adultery is adultery both before and after the Second Vatican Council. This brief affair, however, gives the film’s representation of the priesthood a more modern than traditional twist. In those days, and in most films, a man who would be a priest is one whom it is difficult to imagine being intimate with a woman. This is no doubt the reason why Ruth is afraid that if the affair were revealed, Father Logan would be defrocked. In these days, vocation directors, though they remain committed to the discipline of priestly celibacy, insist that they don’t want men to enter the priesthood because they are in any way incapable of entering into an intimate and committed relationship with a woman. This affair, though it may seem inconsistent with a priestly vocation, can be seen as demonstrating that Michael Logan would not be choosing ordination over marriage because no woman would have him. He has clearly been engaged for some time in serious discernment of a priestly vocation. If Ruth had not been married at the time of the summerhouse affair, he may well have married her. But it does not follow that it was the revelation of her marriage that drove him into the priesthood. Ruth made this confession, remember, in order to provide an alibi for Fr. Logan for the night of the murder. The subsequent determination of the time of death, however, undermines the alibi. Fr. Logan can still say nothing about the murder, so he is arrested and put on trial. At the trial Ruth’s “confession” is entered into evidence. Otto Keller gives false testimony that supports the prosecution. Fr. Logan listens to it more in sorrow than in anger. When called to the stand himself he still can say nothing that would compromise the seal of confession. He cannot lie as Keller did, but cannot expose his guilt. The prosecutor asks whether the blood-stained cassock is his; Fr. Logan says no. When the prosecutor points out that it was found in his trunk and that therefore someone must have put it there, Fr. Logan says yes. When the prosecutor asks who he thinks might have put it there, Fr. Logan answers, “I can’t say,” which means both “I don’t know” and “I am unable to answer that question.” As the question is asked the camera shows Mrs. Keller clutching at her husband’s sleeve, as if she feared that Fr. Logan would give him away (Keller had confessed to him that he’d worn the cassock). Then the camera cuts back to Fr. Logan, and as he answers a large crucifix on the wall of the courtroom is visible in the background. The question and answer very precisely indicate Fr. Logan’s maintaining the seal of confession even under extreme duress. The trial, the verdict, and what follows all foreground Fr. Logan’s faithfulness to this particular sacramental exigency. That, after all, is the main source of the film’s dramatic tension. But there is in the course of Fr. Logan’s testimony an exchange with the Prosecutor which sheds light both on Fr. Logan’s general understanding of his calling, and the Prosecutor’s inability (presumably because he is a layman) to understand what it means to be a priest. And at the climax of the film, when it is revealed to all (without Fr. Logan’s having said or done anything about it) that Keller had committed the murder and why Fr. Logan had seemed guilty of it, the emphasis on the affirmation of Fr. Logan’s heroism makes it easy to miss Ruth’s last line. But first, following the line of questioning about the priestly garb, the Prosecutor asks Fr. Logan about his priestly vocation. He asks him when he decided to become a priest, and whether he came to that decision in order to “hide from” such complications as have arisen from his relationship with Ruth. Fr. Logan says that he decided to become a priest after the war – which tells us a little more about the course of his discernment. In response to the second question, Fr. Logan asserts that “I never thought of the priesthood as offering a hiding place.” This is an assertion that any modern vocation director would endorse. In pursuing this line of questioning, the Prosecutor refers to “certain responsibilities, certain moralities” associated with the priesthood; and Fr. Logan understands him. The camera at this point rests upon Fr. Millais, Fr. Logan’s pastor, as if to confirm this understanding of priestly responsibility and morality. Any layman who knows anything about the priesthood knows on some level that what a priest is and does is supposed to distinguish him from those who are not priests. That the Prosecutor asks both whether there are such responsibilities and moralities, and whether Fr. Logan was aware of them when he decided to become a priest, serves to distinguish the understanding a layman might have of a priest from the understanding a priest must have of himself. And yet the Prosecutor seems confused about how priesthood works in the world when the priest ministers to the worldly. That he imagined the priesthood could be a place to hide seems consistent with his inability to imagine that Fr. Logan’s relationship with Mrs. Grandfort could be anything other than the carrying on of their affair. The one glimpse we get of the jury’s deliberations suggests a similar inability. And yet the meeting on the ferry boat has made clear that Fr. Logan wants only to help Mrs. Grandfort, even though his accompaniment of her has been risky for him. Though the situation is complicated by their relationship, the only proper resolution of it is pastoral and not romantic. Fr. Logan is not hiding behind his collar in order to evade these complications; he is making clear that he is a priest and she a married woman, and that they must deal with the situation on that basis. Under questioning by the Prosecutor, Fr. Logan maintains the Seal of Confession; but the line of questioning ends with his inability to contradict Keller’s testimony. The Prosecution has made a strong case; the Judge thinks that Fr. Logan is guilty. But the jury acquits him, and then the crowd, both inside the courtroom and outside the courthouse, begins to hiss and heckle him. The jury’s unwillingness to hold him responsible for the murder, and the crowd’s eagerness to imagine him immoral, both fail to comprehend what motivates Fr. Logan. The film now moves quickly toward its dramatic climax. Fr. Logan endures the hostility of the crowd with Christian fortitude. Mrs. Keller finally cannot bear to see him so mistreated, and is about to tell all when she is shot by her husband, who then flees. As she dies she mentions Villette. The police detective asks Fr. Logan what Keller has to do with Villette, but Fr. Logan still cannot answer such questions. He accompanies the police, however, as they track down and corner Keller in a ballroom in the Chateau Frontenac. As they gather at the doorway, Fr. Millais arrives with Mr. and Mrs. Grandfort – the priest and the married couple witness what follows. Fr. Logan cannot tell the police what Keller has confessed to him, but he might persuade Keller to give himself up before he does any more harm. The police detective does not allow Fr. Logan to enter the room with the armed suspect, but instead calls in to him, “What about Villette?” Keller thinks that Fr. Logan has told the police what he’d confessed to him, and he reproaches the priest. In this way it is revealed to all just what has been going on. The revelation registers first on the face of the detective, who then looks at Fr. Millais. The reaction of the priest comprehends the pastoral and sacramental significance of Fr. Logan’s action and passion. The camera goes next to Mr. and Mrs. Grandfort, and then to Ruth alone. She gazes beatifically at Fr. Logan, and then turns to her husband and says, “Pierre, take me home.” He puts his arm around her, and they go. It is easy to miss this, because the film proceeds immediately to its final climax. In this Fr. Logan is shown as both merciful and courageous. He is not simply willing to forgive a sinner; he is willing to forgive someone who has done and threatened grievous harm to him. It is his faithfulness to his priestly vocation, I think, that inspires Ruth to recommit herself to her marriage. The film is over sixty years old; but the theology underlying the sacraments of ordination and marriage is still fundamentally what it was. I Confess should be better known than it is, in part for what it can tell us even now about these sacramental ways of life. Catechism of the Council of Trent for Parish Priests. Trans. John A. McHugh and Charles J. Callan. New York: Joseph Wagner, 1923. Francis I, Amoris Laetitia. Vatican Website, 19 March 2016, accessed June 30, 2017, https://w2.vatican.va/content/dam/francesco/pdf/apost_exhortations/documents/papa-francesco_esortazione-ap_20160319_amoris-laetitia_en.pdf. I Confess. Dir. Alfred Hitchcock. Warner Bros., 1953. Film. Francis I, Amoris Laetitia (¶243). Vatican Website, 19 March 2016, accessed June 30, 2017, https://w2.vatican.va/content/dam/francesco/pdf/apost_exhortations/documents/papa-francesco_esortazione-ap_20160319_amoris-laetitia_en.pdf. Catechism of the Council of Trent for Parish Priests. Trans. John A. McHugh and Charles J. Callan. (New York: Joseph Wagner, 1923), 340. Catechism of the Council of Trent for Parish Priests, 338. Catechism of the Council of Trent for Parish Priests, 339. Catechism of the Council of Trent for Parish Priests, 352. B. C. Knowlton is Lecturer in History, English, and Classics at Assumption College in Worcester MA. An interest in language articulates his work in these fields, and animates his teaching of his students. With his wife Eloise Knowlton, Dean of Studies at Assumption, he has written on the Sacrament of Reconciliation in Hitchcock’s I Confess and on the Sacrament of Matrimony in F. W. Murnau’s Faust.